A shortcut to iPhone double exposures. The trick to a stunning double exposure without actually creating it in-camera is usually to start with a darker image, often a silhouette against a clear background, and to apply a second image via layer blending over it. How many images like these have you seen around already? Well, even if you have seen a billion examples of this technique, there is still a lot of space for creativity. 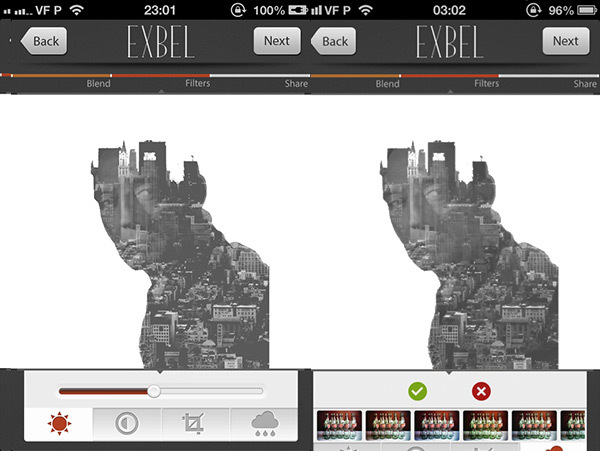 With the help of Exbel, iPhone users can give the double exposure effect a go, too. 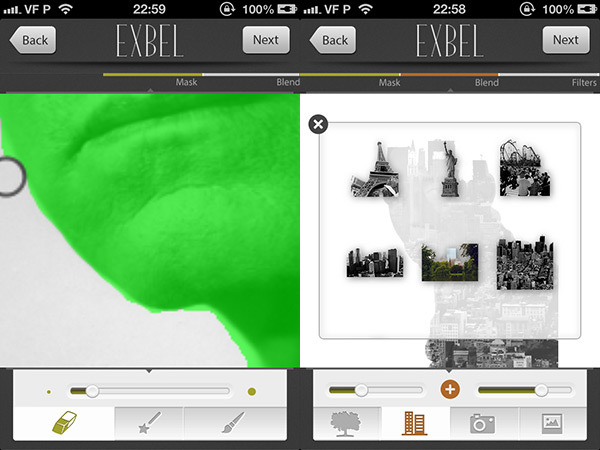 Exbel is enjoying some popularity in the App Store right now, as the app is conceived as a very simple shortcut to obtaining impressive double exposures from any photo. I was pretty excited to try Exbel when the developer kindly provided me with a promo code, but I was not totally satisfied with this app. Exbel is definitely quick and easy to use, but there are several issues that made me realize the tool is still not very practical to be enjoyed thoroughly. Share to Twitter and Instagram. You start by selecting or taking a picture and drawing a mask over it, either with brush or magic wand tool. The mask can be adjusted with the eraser tool (an undo feature would come in handy though). When the mask looks all right, you can choose a second image to blend with the masked one. The app comes with a few sample images—of plants and cityscapes—for using over your masked base, but you can also import your own from your albums. Trying to find the best combination will take some time at first, but you’ll likely end developing an eye for it. To make the result more expressive, you can shrink and enlarge the blended image, while setting the opacity for it and for the base. Once your image is ready, you can proceed to adjust contrast, brightness and crop (free or square). You can also apply a photo filter on your composite image. There are 15 of them in all. Finally, you can save the composite or share it via Twitter and Instagram. It’s possible to zoom in and out for precise masking, but even with very high resolution images, the app’s selection gave me very noticeable jagged borders when zooming all the way in. I noticed the same happening with other apps working with brushes and masks, and in those cases the workaround to a jagged border was using a softer edge brush. You can change the brush’s size in Exbel, but unfortunately not its hardness. This not only makes it impossible to get rid of jagged borders in some instances where you necessarily have to work all zoomed in (unless you apply blur with the aid of another app, that is), but it also makes it very tough to end with a neat-looking result when the base image is particularly complex to mask. Note that if there are masked areas that should be unmasked, they will likely show in the final image, unless you turn off the base image’s opacity entirely. The magic wand tool made the app crash continuously for me, so I eventually gave up trying to use it. Another issue concerns the app’s output resolution. I had the “Use full resolution image” switch turned on and I selected the “Max” setting before saving; despite this, I’m not sure why, I could only manage to save up to a mediocre 1000 x 790 pixels, no matter how big the original file was. There are some problems with the interface on 4S as well. Some screens, like the photo filters one, will be partially cut off, as you can see from the screenshot above. This doesn’t really affect the app’s performance, but it’s still annoying to see. Exbel is optimized for iPhone 5; even keeping this in mind, its possibilities are limited and there are a few things that could be improved. On the other hand, the workflow of this app is very straightforward, without many options to mess with. All things considered, the idea behind the app might be nice and all, but it’s not functional or refined enough. 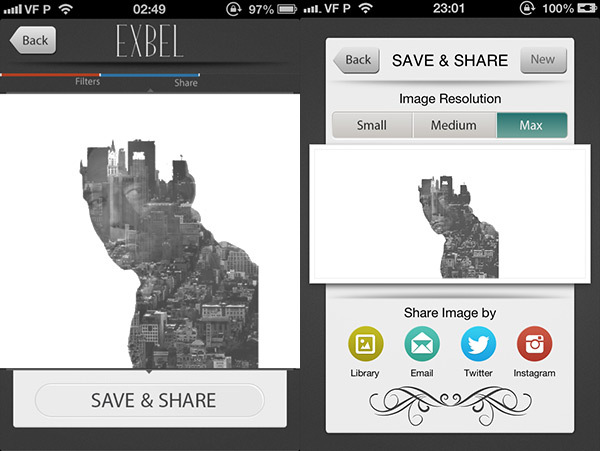 If you are precision-oriented and value the high resolution capabilities of your iDevice, picking Exbel as the ideal tool for the double exposure effect may be disappointing. Even if it will be more time-consuming, using an image editor like Image Blender, Laminar or PhotoForge2*—or even the still clunky Photoshop Touch—to achieve the same will be more convenient in the end. Thanks to Yaser Almajed for providing us with the promo code for reviewing Exbel. *now discontinued but still available to users who purchased it in the past. I found this app a little frustrating. As you say, I’d rather use Img Blender, which I really like, for similar effects. I have more control over the final picture. Thanks for the review. 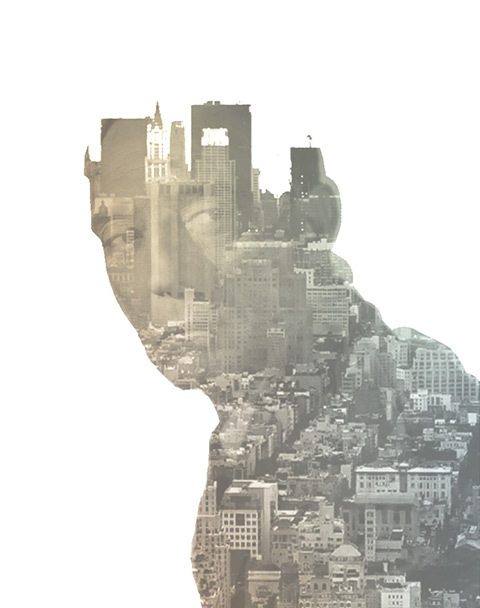 There seems to be an increase in apps for double exposure photography. Though Img Blender works well enough, I found Mexpose to be the best. However it requires you to take pictures that are reasonably well suited for a double exposure, as there is no masking.